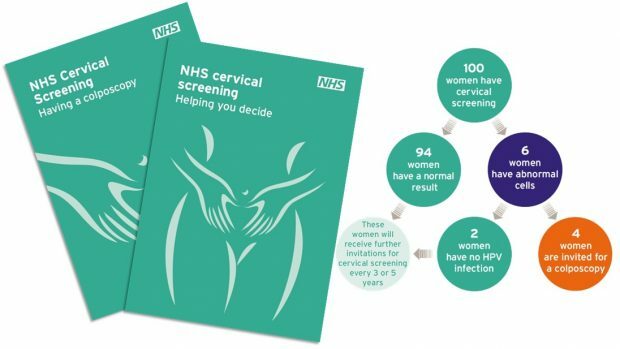 The NHS Cervical Screening Programme has introduced new invitation and result letters, along with new information leaflets for women invited to screening, and for women who are referred for colposcopy following an abnormal screening result. An independent team of health information experts from King’s College London developed the leaflets and letters. They gathered extensive input and feedback from screening professionals, clinicians, academics, charity representatives and women of cervical screening age. This rigorous process helped to inform the letter and leaflet content, and how it is presented. The new invitation letter makes it absolutely clear that attending screening is down to individual choice. It also has space for the GP practice where the woman is registered to enter specific information, such as mentioning female sample takers and clinic times or practice details. The new result letters contain result-specific information, so the old leaflet Cervical screening – what your abnormal result means is no longer needed. The letters aim to give women clear and simple information which is easy to understand. Result letters regarding non-cervical abnormalities have changed and they advise the woman to make an appointment to see her GP for a referral to a gynaecologist as soon as possible. This alteration was implemented following feedback from the programme. We also completed a review of the letters used when a woman has been ceased from the screening programme. Similarly, we have changed these letters to address concerns previously highlighted to us by programme users. It should be noted that the large number of result letters include some that are only intended for exceptional use, as they relate to scenarios outside standard protocols. We have provided call/recall teams with guidance on the use of these and all other result letters. The letters are to be used with the two new leaflets: Cervical screening - helping you decide (sent with the screening invitation) and Cervical screening – having a colposcopy (accompanying results letters which include referral for colposcopy). The leaflets are in an easier to read format and are A5 size. The invitation leaflet provides key information to help women weigh up the risks and benefits of screening in order to make an informed choice. It covers information about the human papillomavirus and advises women that, depending on the result of their (cytology) test, their sample may be tested for the types of HPV that can cause cervical cancer. The leaflet also highlights other resources for women to access further information on cervical screening should they wish to. The NHS Cervical Screening Programme has worked extensively with colleagues in NHS England to enable the implementation of these new materials and this process is currently under way across England. I would personally like to thank all those staff in the programme who are making this happen. Please use the link below which will take you to the contact form to get in touch with our screening helpdesk. Can we order these leaflet pre printed and if so what is the contact number/email? Local screening providers can order supplies of PHE Screening public information leaflets free of charge from our national print supplier. See http://www.harlowprinting.co.uk/screening/ for details of what leaflets can be ordered and how to order them. Leaflets should only be used according to the national programmes' service specifications and are limited to one invitation leaflet per person per screening episode. Is there a disclaimer form that we can use for patients who wish not to have the screening this round, or at all? It is necessary to contact the cervical screening department at Primary Care Support England (PCSE) to change a woman’s recall date or status. To stop invitation and reminder letters for a single screening round, the woman’s test-due date should be deferred for 3 or 5 years (according to age). To stop all future invitation letters, a woman can permanently opt out of the screening programme. PCSE will sent an opt-out form to the woman at her registered address and will remove her from the screening programme as soon as the signed form is returned to the screening department. Notification of postponements or opt-out requests should be made via the GP practice. The practice can contact PCSE by e-mail, fax or letter. "Do you have or know someone who has cervical cancer? Fortunately, the mortality rate for cervical cancer isn’t as high as the mortality rate for certain other cancers, but it’s still deadly. For example, you can look and see that a little over 12,000 cervical cancer diagnoses were reported in 2012, and that is in contrast to the number of cervical cancer deaths that year, which was a little over 4,000. While that doesn’t necessarily mean that there is a 33 percent mortality rate for cervical cancer patients, but it gives you an idea of what the numbers are anyway." The website is badly-written, inaccurate and unreferenced - not a great resource to be directing women considering cervical screening towards and the leaflet is let down by its inclusion. Thank you for your comment. We are aware of problems with some of the information on that site and will be addressing this issue by making amendments to the next iteration of the new national patient leaflets. Hi , Where do I get a copy of the new invitation letters ? A copy of the invitation template letter is available on request from PHE screening. Primary Care Support Services England provide screening administration services which includes delivering prior notification lists of patients eligible for screening to GPs, sending out invitation communications and notifying patients of test results once received. PSCE are expected to use the PHE template invitation letters, click here for a list of PCSE offices and the current contact details.